Ammunition: pellets or steel BBs cups. 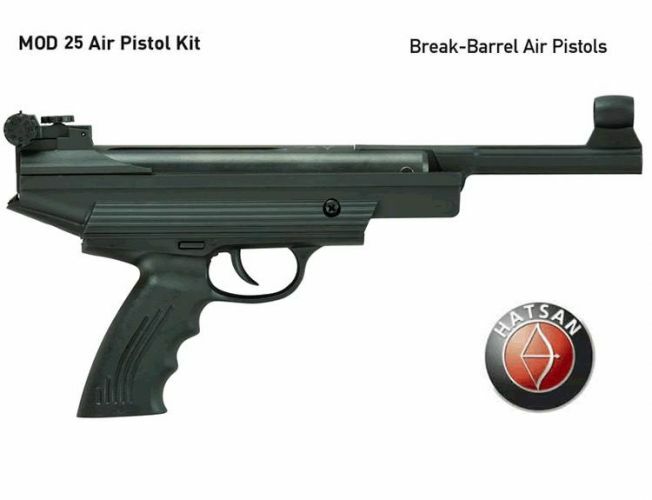 • Break barrel, single cocking system & single shot semi recoiless air pistol. • 4.5 mm (.177) or 5.5 mm (.22) caliber. • Ergonomically designed, rugged & compact design synthetic pistol grip. • Precision rifled steel barrel-outside covered with synthetic. • Cocking safety (anti bear-trap). • Grooved cylinder for scope mounts. • Micro adjustable rear sight. • Comes in its box with a free “Air Pistol Pellet Catcher”, “Hatsan Target papers”, “Hatsan Pellets” and “Cocking Aid".